On the roof of a condo in downtown Nashville, Urban Hydro Project founder Jeffrey Orkin is redefining the meaning of space-efficient urban agriculture. Orkin has turned a former rooftop utility room into a 135-square foot hydroponic grow room where he raises various types of lettuce, basil, arugula, dill, kale, cilantro, mustard greens, and more. 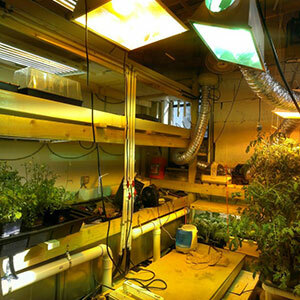 In December 2012, Orkin launched a Kickstarter campaign to raise the funds he needed to build the grow room. Those who donated to the campaign were promised certain amounts of lettuce, basil, and arugula in return, and Orkin has been busy over the past year distributing these greens to his supporters. Orkin has also been busy selling his produce to residents of the condo unit he grows in, other community members, and local restaurants in the Nashville area. So far, Orkin says, Urban Hydro Project has been a break-even operation and he is satisfied with that. In addition to the work he does with Urban Hydro Project, Orkin maintains a full-time job, having never really envisioned the project as a profit-making endeavor. Instead, Orkin sees the grow room as a research and development facility. He has used the space to experiment with different growing systems and crops, with the ultimate goal of developing a sustainable hydroponic business plan. “I have grown a little bit of everything over the past twelve months just to test out different crops and yields,” says Orkin. Some of the different types of hydroponic systems Orkin has tested in the space include floating raft systems, vermiponic systems, and ebb-and-flow systems (in which the growth media is alternately flooded and drained). Orkin also sees the project as an opportunity to educate the public about the benefits of urban agriculture. Some of those benefits, Orkin believes, include that it requires less space and less water than conventional farming and provides people with fresh, local produce year-round. Orkin has already spoken at several community events and has developed educational modules that he hopes will eventually be used in school systems. “Hydroponics is actually an exceptional teaching tool because a lot of the food that people are used to eating is grown in the summer when children aren’t in school. Having the ability to grow indoors, more efficiently, and quicker allows students to say ‘Oh, I planted this seed and it turned into lettuce’ and have the whole ‘that’s where my food comes from aha moment’,” says Orkin. As Orkin gains more information and experience, he hopes to expand both the educational and production components of the project. He believes that by starting his hydroponic endeavor on a smaller scale, he is protecting himself from potential catastrophe, and advises other hydroponic farmers to follow his lead. With this in mind, Orkin is taking small steps toward developing a sustainable business plan that fulfills his primary reason for starting the project: providing year-round access to fresh, locally grown food. “My goal is to finalize the business model so that I am capable of expanding to a large-scale indoor operation, and then selling a variety of food to restaurants in the area, as well as really starting to launch that community outreach piece and helping educate people about fresh, local food and food choice and things of that nature,” says Orkin.